Visualization of the magnetic effect in LaMnO3 layers using Scanning SQUID Microscopy. Researchers at the MESA+ Institute for Nanotechnology of the University of Twente in the Netherlands have discovered an unusual magnetic effect in nanolayers of an oxide of lanthanum and manganese (LaMnO3). Joint work with colleagues from Singapore, the US and Ireland revealed an abrupt magnetic transition brought about by the slightest change in thickness of the layered material. This work is described in a paper in Science. Materials with exceptional electronic and magnetic properties are of great importance for many applications. A particularly versatile class of materials are the ‘perovskite oxides’, which includes LaMnO3. In the reported study, the researchers have discovered a special effect relating to the magnetism of LaMnO3. This material consists of stacks of LaMnO3 unit cells, comparable to stacking blocks of LEGO. In this case, the individual building blocks are only 0.4nm in size. The new discovery is that magnetism in these layers is switched on abruptly when the number of LaMnO3 building blocks changes from five to six. The scientists discovered this when growing thin films of the oxide on a perfectly flat crystal of non-magnetic SrTiO3, using a technique called pulsed laser deposition. By adding a sixth layer of LaMnO3, the material switches from antiferromagnetic (antiferromagnets produce no magnetic field) to ferromagnetic. Such an abrupt transition has never been seen before. 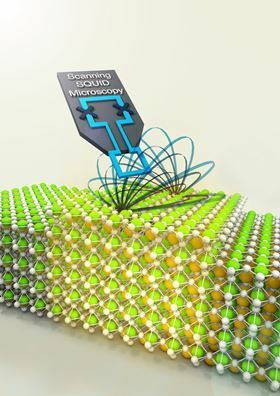 Using a Scanning SQUID Microscope, an instrument that uses superconducting electronics to measure magnetic fields with exquisite sensitivity, a direct image of the change in magnetic properties was obtained. In their paper, the researchers give an explanation for the abrupt switch from antiferromagnetism to ferromagnetism. This involves an avalanche of electronic charge inside the LaMnO3 thin film, from the top surface of the film to the bottom. The discovery of such a sharp critical thickness for the appearance of ferromagnetism makes it possible to define magnetic structures on the nanoscale and implies that a very sensitive new functionality is present, in which a slight alteration or addition can alter the magnetic properties of the structure. The researchers expect that this behaviour won’t just be limited to adding new layers, but could possibly arise from other manipulations such as applying electric fields or adsorbing specific molecules. Further study will be conducted by the researchers, aimed at using the effect in information technology and sensors. To read more about lanthanum manganite (LaMnO3), please click here. By applying hydrocarbon molecules with two different magnetic centers to a gold surface, scientists have produced the first 2D ferrimagnet.